We now have 400 confirmed guests and we are SOLD OUT. This event is organized by Sharif University of Technology Association in affiliation with Mohandes and Fanni Ontario. We are happy to announce that honorable Prof. Fazlollah Reza, former chancellor of Sharif University and Tehran University, former ambassador of Iran to Canada, and former ambassador of Iran to UNESCO will be our honorary guest in the event and he will be acknowledged for his lifetime cultural and scientific services to our homeland, Iran. 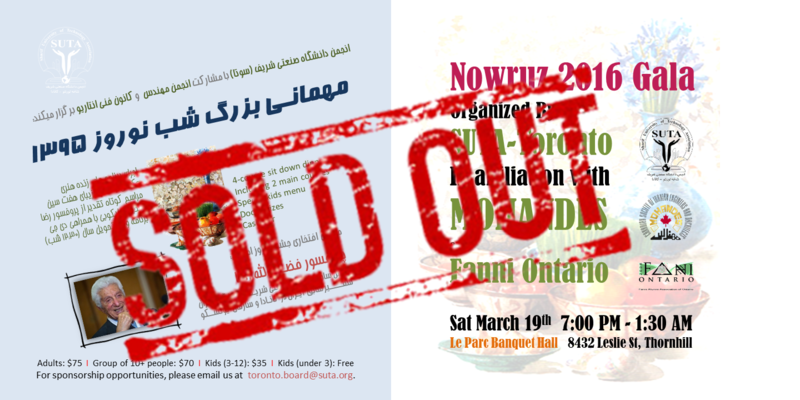 Except of eventbrite (The "Buy Tickets" link below), you can buy your tickets through SUTA, Fanni and Mohandes organizations or alternatively by email money transfer to toronto.board@suta.org. If you are a paid member of SUTA, you are also eligible to get $5 discount for up to 2 tickets by March 15th. Please email us at toronto.board@suta.org for more information. Hope to see you all on March 19th at the event.